The NASL Fall Season kicked off last Saturday and, in many cases, the theme of the weekend was the impressive form of the league’s young players. 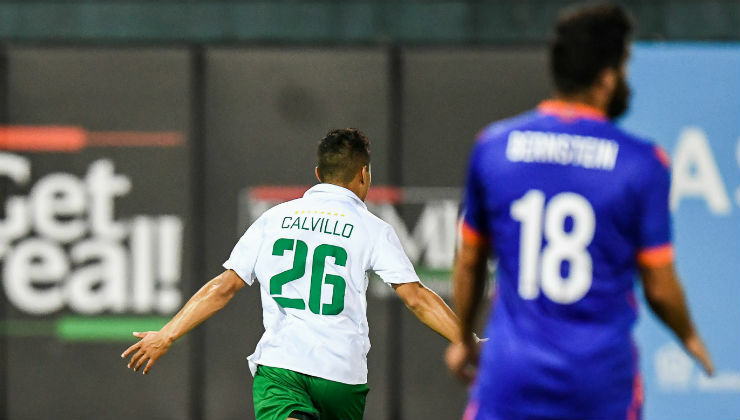 In New York, Eric Calvillo scored a pair of goals and was named NASL Player of the Week. Jacksonville Armada FC’s Derek Gebhard drew a penalty, which was finished off by another promising young talent in Jack Blake. Indy Eleven continued its hot form with youngster David Goldsmith getting on the scoresheet in a road win. And while he didn’t feature in the Fall Season opener for North Carolina FC, 18-year-old Jose Carranza has started to earn regular minutes after looking mature and composed in the heart of the club’s midfield. Young players stepping up in 2017 has been more of a trend than an aberration, though. Gebhard has scored four times this season – the first goals of his fledgling career – while teammate Blake has now scored three times. Calvillo, a U.S. youth international, has been the recent star. In the final weekend of the Spring Season, he scored a game-winner against FC Edmonton and followed it up with a strike against La Liga side Valencia CF in an international friendly. This past weekend, he scored twice to defeat the Spring Season Champion, Miami FC, 3-1. “Once I build the confidence, the game will just come to me,” Calvillo told NASL.com prior to his double on Saturday. Calvillo is in his second season with the club, and scored once in three appearances with the Cosmos in 2016. So far this year, he’s appeared five times, making three starts, and scoring three goals. The midfielder looks primed for even more opportunities on the field during the Fall campaign. In Jacksonville, Gebhard has followed a similar arc. The young forward made a total of 17 appearances in his first two years with Armada FC, but has already equaled that number, with 10 of those appearances coming in the form of starts. For Gebhard, his first goal came in a 3-0 win over the San Francisco Deltas on May 19. That strike, which saw him curl the ball into the top corner past veteran goalkeeper Romuald Peiser, proved to be a catalyst for his success. Carranza, who is another current NASL player involved with the youth national team, has turned heads with his performance for North Carolina FC. He has appeared in six league games and picked up the all-important assist in the club’s big win over Miami FC earlier this year. Carranza also recently signed a professional contract with North Carolina after playing on an amateur deal to start the year. Earlier in the season, before being hit with an injury, young midfielder-turned-defender Robert Baggio Kcira was in dynamic form for Miami FC, leading the league in several categories to start the year. For these players and their young careers, the NASL has been a great place to learn, develop, and get important minutes out on the field. With youthful talent starting to become impactful talent, the NASL path may continue to be a strong option for developing players. “I hope so,” Calvillo said of his choice to play in the NASL becoming an example for others. “That’s what I’m trying to do. I’m not only trying to prove this for myself, but for any other youngsters.